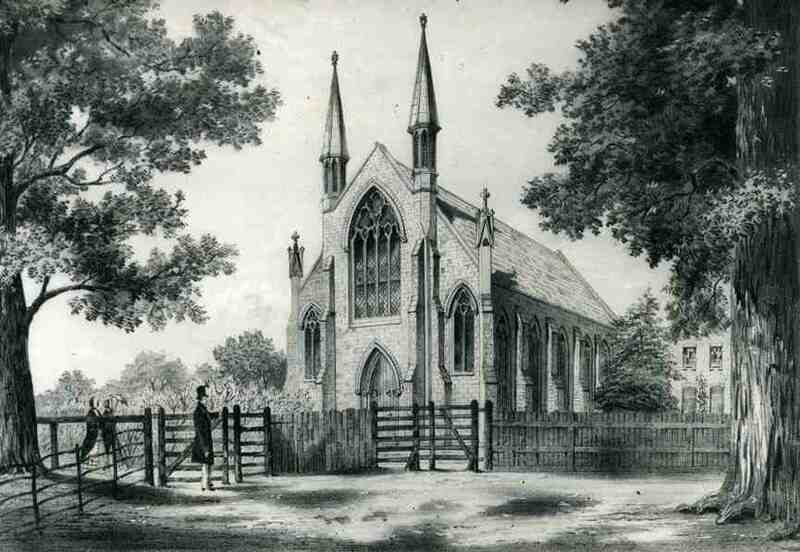 David Vesey sent this 19th century drawing of the Park Baptist Church on Boston Road, where his grandparents married. Park chapel, at corner of Boston Manor and Great West rds., New Brentford. Mtg. founded 1799 by minister at Hammersmith in house in Market Place, later in minister's house as Particular Bapts., and moved 1808 to chapel NW. of Market Place 1808, which was enlarged to seat 190 after foundation of Sunday school 1817. Supported by Hammersmith meeting 1824-9. Attendance 1851: 77 a.m. (inc. Sunday sch. 21); 35 children afternoon; 100 evening. Services in town hall from c. 1851 until 1855, when surviving chapel seating 500 opened. Attendance 1903: 190 a.m.; 426 p.m. Classrooms added 1869 replaced 1936 by hall, where services held 1940 until 1950 reopening of bomb-damaged church, seating 400 in 1978. Seceders founded W. Ealing Bapt. church 1864 and Ealing Rd. Bapt. church c. 1893, the second reuniting with Park chapel between 1903 and 1923. Albany (Independent) and Park chapels amalgamated 1879. A photo in Then and now Brentford page 39 shows a building on Boston Manor Road which ’in 1988 the congregation of the Park Baptist Chapel came to share’. Presume this chapel is south of the original Park Chapel site (which was sold ‘enabling the two congregations to finance the restoration of the 1783 building to its original appearance’). It is today known as the Brentford Free Church. The same book has a distant view of the Park Baptist Church from the 1930s, perched on the edge of the Great West Road, and notes that it was built in 1855 to seat 500 worshippers. It was demolished in 1990 (p. 91). See David's related requests for images of Park Baptist Chapel and the area near Fern Bank. The archive photo series - Brentford includes a 1935 photo of the Park Chapel showing the same building as in the image below (page 116). At Brentford, on the 10th January, in the faith and hope of the gospel, Mr. Frederick Coulton, Deacon of the Church at Park Chapel, Brentford ; leaving a widow and five children to lament his loss. In his removal the Church at Park Chapel has sustained a heavy bereavement. His re- mains were interred at Norwood Cemetery on the 18th January— Rev. W. A. Blake conducting the service. Park Chapel, Brentford.— October 17, a meeting was held to welcome to his new pastoral labour the Rev. W. A. Blake. The Rev. Dr. Burns, of Paddington, presided. Addresses were delivered by the chairman, by W. J. Maxwell, Esq., and by the Revs. B. Davies, W. P. Balfern, J. Radford, J. 0. Fellowes, and other ministers. BURNHAM, John — A noted English evangelist, great grandson of Richard Burnham, born at Cranbrook, Kent, January 26, 1849. In his youth he displayed rare musical gifts, and after his conversion these were turned to good account in the Lord's service. He professed religion in 1869, and four years later entered the Pastors College, London. From 1874 to 1877 he was pastor at Fivehead, Somersetshire, but from this period he gave himself fully to evangelistic work. In this department of Christian service he was eminently successful, winning many souls to Christ. For a number of years his residence was at Brentford, but his labors were extended to various parts of England. In October, 1904, he visited Jamaica to engage in evangelistic meetings among the Baptist churches of the Island. Died at Fern Bank, Brentford, Sept. 29, 1912. (S.&T. 1894, 432; B. H. Book 1913, 477; Bapt. Times, Oct. 11, 1912).